I was born in 1950 and married in 1982 to Alison, also a painter. I did a lot of art at school, especially stage scenery, but took the academic route and went to Cambridge (St John’s College) to study history and art history. After four years in art dealing, I returned to Cambridge for research in art theory. After marriage I worked for seven years for UCCF, the Christian mission to students and graduates. Then I was invited to write a book on art. In my last year at UCCF I attended City and Guilds School of Art in London, part time. In 1999 my wife and I moved to a beautiful part of England, the Cotswolds, where we built a large studio, in which to paint, hold art classes, and exhibit our work. 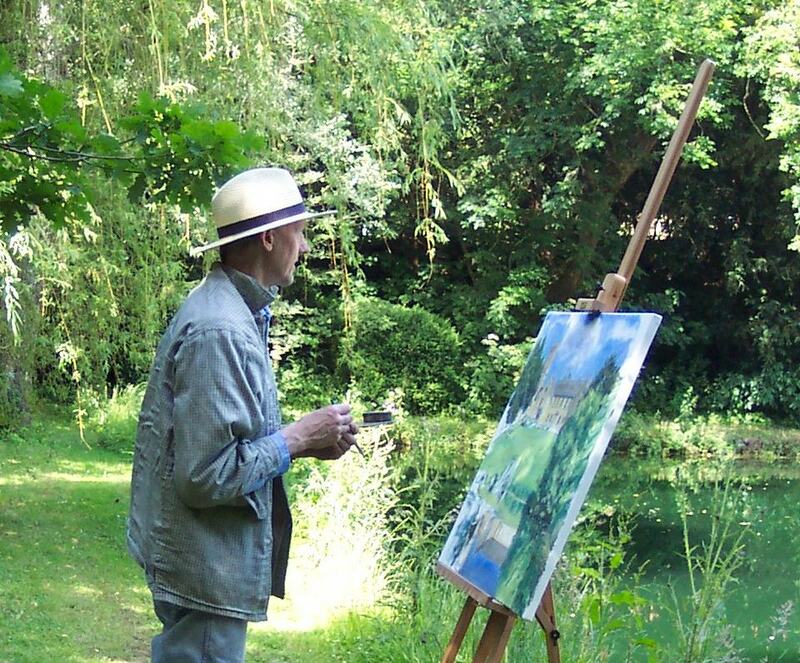 I attended two summer landscape painting courses in Italy, with the Russian artist Daud Akhriev. I have done landscape and portrait commissions and many of my paintings are in collections in England, Scotland, Italy and the USA. I try to paint ‘ordinary’ pictures that are quite intelligible! This is partly because these are the kinds of paintings I enjoy. My artistic education was quite traditional: at Cambridge I studied baroque art; in London I worked in an art dealers’ which specialised in British figurative art and European art up to 1900. However, as with all my generation, I needed to understand why art had taken such a radical path in the 20th century and this took me back to Cambridge for a period of academic research. Not surprisingly, I found it impossible to find the answer! However I did find something much better. After a long struggle, in which I finally put my intellect in Jesus’ hands, I began to see why art was in a wilderness, as I had been. I realised how relevant Christ’s sufferings were to the anger and anguish of 20th-century art and how Jesus is the way out of meaninglessness. It was many years later that I began myself to paint, having written a book on art (The Art of God, 1998) that had, so to speak, cleared the way for me to try to paint ‘reality’. For me, the nature of visible reality is the question that lies behind figurative art. There is a battle for vision. Sometimes I find that scientific and evolutionary descriptions of the world press in on my vision, draining it of life. Other times the truth takes hold that the visible world is just one part of a total visible and invisible reality, born out of Christ’s creative energy and with a redeemed future in him. This means that the world does not just exist as a surface we can measure scientifically, but has endless depth which artists see as ‘meaning’ and can access through the Spirit. I pray constantly for God to open my eyes, because naturally I do not see as I should. Portraits are another area where ‘meaning’ is important. Good drawing, painting and a likeness are of course essential aims, but one needs to see beyond that: people as persons have a weight and significance which is quite beyond character or achievement. I believe that a good portrait will find and reverence that ‘theological reality’ simply because it is there and it is the truth. Beauty is important to me. As an ideal it has rightly come under suspicion in the century of two world wars. I do not think beauty was given to insulate us from reality: but it is a sign of how things should be. Beauty for the Greeks was a matter of perfection, but Christ has taught us to see beauty in what is poor, lowly and disregarded and that is a great gift. The challenge for me is to connect up emotionally and spiritually with the world I see and to translate that into paint. 1. 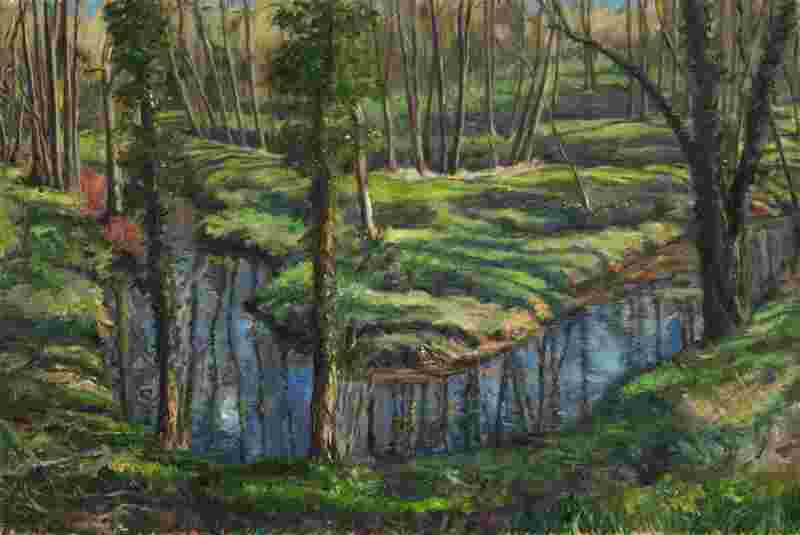 The River Churn, Gloucestershire, Spring 2012, oil on canvas, 61 x 91.5 cm. This picture was painted mostly out of doors during a sunny week and then continued in the studio. Although it was a large canvas to work with outside, I found I could paint with great freedom and involvement and explore the symbolic and emotive aspects of the scene. I was influenced by the grandeur of Poussin’s great landscapes. 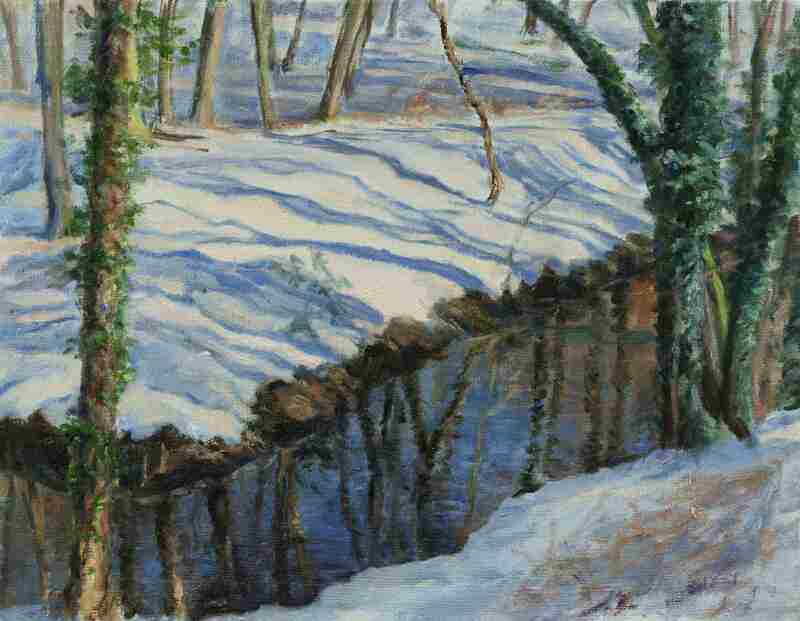 2 Snow, Long Shadows, River Churn, Gloucestershire 2012, oil on canvas, 27 x 35.5 cm. When the sun is low in winter, beautiful shadows give a sense of peace. This was painted out of doors with plenty of warm clothes! 3. 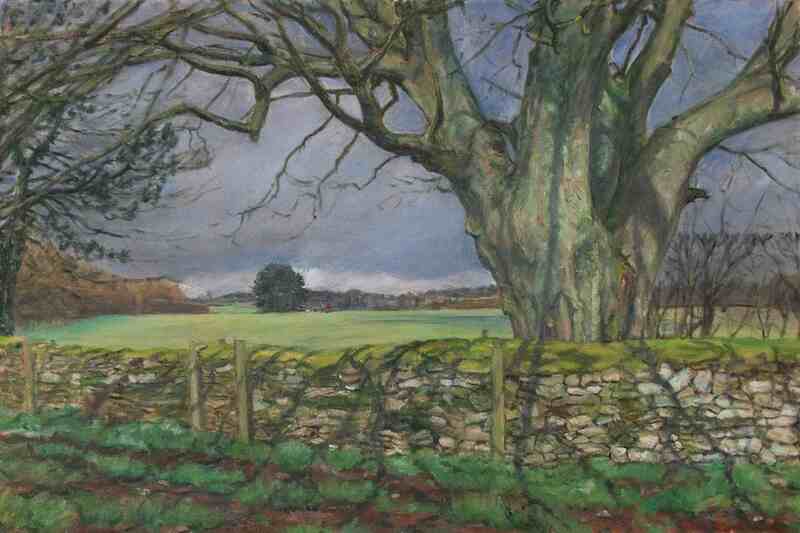 Field Maple Tree, Stormy Weather, Easter 2010, oil on canvas, 51 x 76 cm. The subject of this weathered tree, floodlit against a stormy sky, appealed to me and it was not until it was near completion on Good Friday that I saw that the tree against a dark sky has echoes of a crucifixion scene. 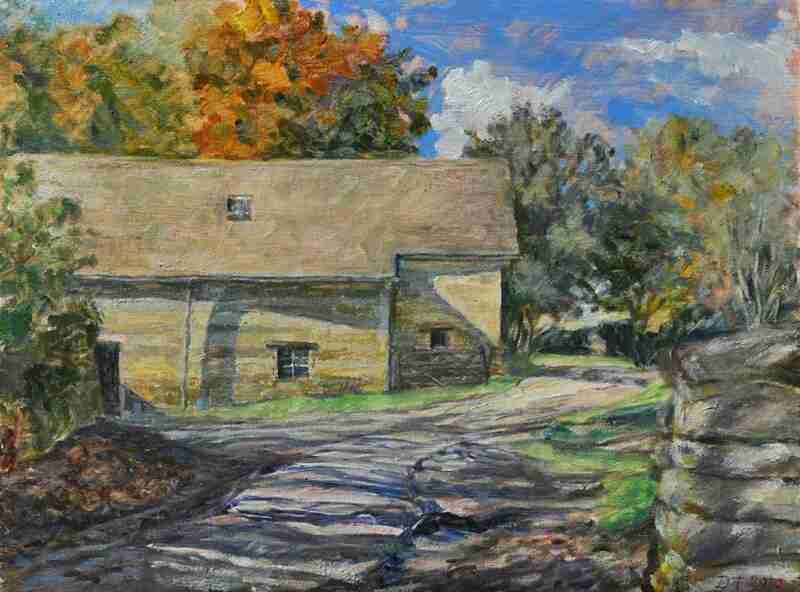 4.The Stables, Ablington, Gloucestershire, autumn 2011, oil on canvas, 30 x 40cm. This is a working stable yard, painted out of doors in the crisp autumn sunshine. Gloucestershire is full of old stone buildings, which to those who work there are simply part of the scenery. They speak of a historical time when work did not have to be separated from art and beauty. 5. 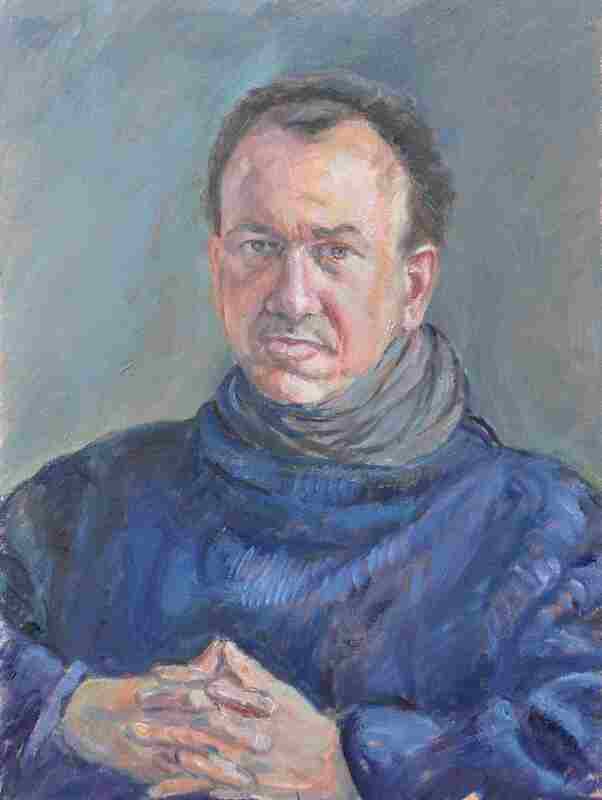 Portrait of Nick, 2011, oil on canvas, 76 x 63cm. While painting this portrait commission, I learned some of the extraordinary life of this good friend of ours (sleeping rough, and worse) before he came to Christ. It is a privilege to get to know such a person. 2013 Wells Cathedral Chapter House ‘Present God’, jointly with my wife Alison Thistlethwaite. 2007 Paintings with Russell Gallery, London. The Art of God and the Religions of Art, Solway books (Paternoster), Carlisle, 1998.